Well, we’re five games into the Minnesota Wild’s season, and the results so far have been mediocre at best. The team’s record sits at 2-2-1, which is OK. The problem is, they have just one point in their past three contests( two regulation losses, and an overtime loss to St. Louis). So, panic is beginning to set in here in Minnesota. With that said, let’s get to some observations and some quick hits I have about the Wild after the first week of the season. Minnesota’s first line of Zach Parise, Mikko Koivu and Dany Heatley have combined for 10 of the Wild’s 13 total goals this season. In addition to the goals they have produced, they have also provided constant pressure on the opposing team. Often possessing the puck in the offensive zone throughout the whole of their shift. Without this line producing the way they have, there is a good chance the Wild would still be looking for their first win of the season. Yes, the first line has been great for the Wild. However, the rest of the forwards have not produced nearly enough. The second, third and fourth lines have combined for just two goals in five games. If you think that is going to be enough production for this team to make the playoffs, you’ve probably got an online girlfriend you’ve never seen before; are drunk; or have recently purchased Green Bay Packers stock and now think that you are a part owner of the team (Here’s some free advice: never use real money to buy something that is worthless and fake). Anyway, Mikael Granlund and Pierre-Marc Bouchard are the only forwards not on the top line to have scored this season. That has to change if the Wild want to make the playoffs. Because you can’t expect the first line to continue to produce the way it has all season. And if the Wild can not find consistent production from their second, third or fourth lines, this will be a long, goal-less, and very disappointing season (kind of like last season, the season before that, and the season before that). How to get a more balanced line up? The only remedy to get the second, third and fourth lines to be more productive is to switch up the lines or call up prospects from the minors. Now, you don’t want to break up the first line because they have played great together. So, what else can you do to get more offense? Do you call up prospect Jason Zucker from Houston? Zucker has been the best player for the Aeros (the Wild’s minor league team). And is known for his offensive capabilities. But if you call up Zucker, someone will have to be sent down to Houston or released. And while the lack of productivity from some players has been noticeable, the season is only a week old. So, you don’t want to give up on anybody just yet because things could still turn around. However, if this is still a topic of conversation at this time next week, the Wild may be forced to call up Zucker and potentially others, because they can ill-afford to wait for certain guys to find their game in a shortened season. 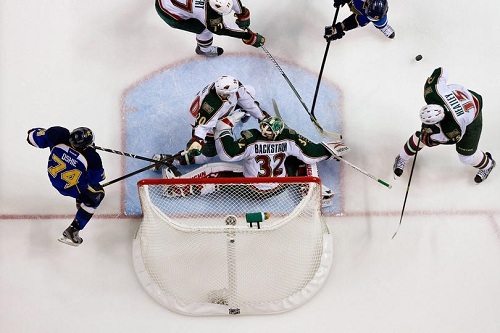 ST. LOUIS, MO – JANUARY 27: Niklas Backstrom #32 of the Minnesota Wild makes a save against the St. Louis Blues at the Scottrade Center on January 27, 2013 in St. Louis, Missouri. So, changing up the lines is your best bet. One change that has already happened is swapping Pierre-Marc Bouchard for Matt Cullen on the second line. I have been clamoring for this change since Bouchard was cleared to play. Matt Cullen may be a great guy, but I’ve had enough of watching him fail to be ready for Granlund’s passes, and I’m sick of his inability to finish around the net. Quite frankly, he is not a second line NHL player anymore. By putting Bouchard with Granlund and Devin Setoguchi, head coach Mike Yeo has shown he understands the urgency of the shortened season and that he will make changes if you’re not producing up to your capabilities. It is now up to Bouchard and Granlund to produce the expected results on the ice. And I think they can. Both players are offensively gifted and creative with the puck, so this should open up room on the ice for Setoguchi to shoot. And he has a great shot. Now, he just needs to remember where he stowed away his accuracy during the lockout. The addition of Cullen to the third line should make them better defensively. As Cullen is a far superior defensive player, when compared to Bouchard. Hopefully he, Kyle Brodziak and Cal Clutterbuck can shut down the opposing teams’ top line, while potting a few goals for themselves in the process. Ryan Suter has been better than his numbers indicate( – 5 rating and on the ice for 10 of the first 13 goals the Wild allowed). But, someone should indicate to him that it is OK to clear the opposition from in front of his own net. Twice, in the past two games, he has allowed someone to stand right in front of his goaltender, while he looks on from five feet away doing nothing. In both instances, goals where scored. Now, I’m not sure if this was Shea Weber’s job in Nashville. But come on, it’s hockey 101-never let an opposing player camp in front of your net unabated. Zach Parise has been as good as advertised. In fact, he has exceeded even the loftiest of expectations placed upon him before the season started. With five goals in five games, to go along with four assists, he has been in on nine of the thirteen goals the Wild scored this season. He has been worth every penny paid to him. I shudder to think where the Minnesota Wild would be without Zach Parise. Jonas Brodin, the Wild’s 2011 first round draft pick, has been impressive in the first two NHL games he has played. His speed, skating ability and hockey sense have been incredible for a 19-year-old rookie. Once he adds more strength to his game, he will be a dominant NHL defenseman for years to come. Anthony Laplanta, the Wild’s TV play-by-play guy is pretty awful at his job. He displays a severe lack of passion and knowledge for the game, in my opinion. The fact that he has the job because he came cheap is another mark against Wild owner Craig Leipold, whose team has yet to make the playoffs since he bought them five years ago. Just saying.